A home or commercial building is only as good as the foundation it’s built on. And regardless of how well-constructed a structure may be, most foundations settle. That’s just a fact of life. 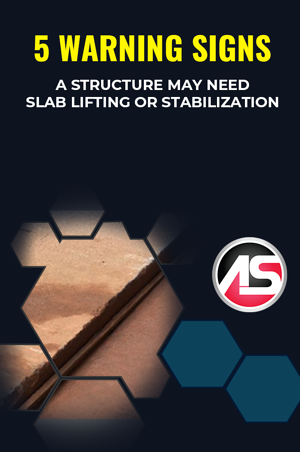 Shifting soil compaction and many other environmental conditions that tend to cause settling, however, should ideally be stabilized before significant structural damage is done. One or two minor hairline or shrinkage cracks shouldn’t necessarily send off any warning bells – though both merit monitoring. But multiple or widening cracks indicate more serious problems and may lead to additional damage. For the property owner, this can disrupt business, displace occupancy, and cause a domino-effect of infrastructure woes serious enough to break the bank. Or worse. Litigation can result if preventative action isn’t taken before loss or injuries occur. It’s estimated that 60 percent of homes built on expansive soils result in shifting and heaving in all or even just part of the foundation. One can’t-miss sign of distress caused by wobbly soil compaction is buckling and bulging wood floors or evidence of cracking concrete in other types of flooring. When soil moisture levels are all over the map, you can be sure that problems will ensue. Poor drainage, soil decomposition, naturally occurring conditions, nearby sewer line damage, underground aquifers – all can play a role in fluctuating soil moisture levels that lead to foundational settling. Cracked sheetrock or concrete walls are a warning sign that trouble is brewing underneath the surface. When doors suddenly start sticking or won’t easily open or close, it’s a sign that either moisture levels are causing the door to swell or something in the structural frame has shifted. And that something might very well be the foundation. Look up toward the ceiling or down at the floor for moldings that may have gone wonky, jutting this way or that. Leaning Trees, Fence Posts, Etc. It’s hard not to notice a tree, fencepost, mailbox, or flagpole that is leaning like the Tower of Pisa. If you don't associate this abnormality with foundational distress, you should. It can be a sign of sinkholes – the kind that gape and maw without warning. If the site you're evaluating is in what is known as karst terrain, which about one-fifth of the nation is, it's susceptible to sinkholes. Likewise if there are abandoned coal or other mines, sewer construction or groundwater pumping nearby. All are signs that further investigation may be needed, pronto.